Definitely my favourite hostel I've stayed in so far! Really felt like a hotel with lots of rooms on the same floor, a cleaning service, and a lift to access the building. Staff were friendly and kind and even upgraded me to a four person room when I arrived! Lovely view and nice big lockers. I slept really well. The showers are also really good with a separate section so water doesn't get all over your clothes, and the floor outside the shower is heated! Would recommend to anyone. Very nice hostel Location wise and cleanliness wise as well. Kitchen is present so you can cook ur quick breakfast. Stayed in a double private for a short stop in Bergen. Room was clean and bed/pillows were comfortable. Staff were friendly and knowledgeable about things to do/places to eat. Location is walking distance to everything you'd possibly need in Bergen. Showers were clean and warm. No complaints. This hostel has a good location and good amenities (large kitchen, common space). The location is also perfect, close to the center as well as Floyen. The reduced hours was a bit annoying (luggage room only open until 4) but understandable. It is also important to note that this is more like a guesthouse in that there are families etc and the atmosphere is not very social. That being said, it was not impossible to meet people; you just need to really put yourself out there. Great hostel in the best possible location (near the train station and city center!). Very professional and common facilities cleaned well every day. Only thing that was a nuisance was the common areas (kitchen, dining tables, lounge) were much too small for the amount of guests there. Also the pillows could be updated to something with a bit more material. Other than that it was a fabulous stay. Great stay, great location. Sucked the breakfast wasn’t in the building but it was well worth the walk!!!! Really a decent place to stay near enough to downtown Bergen. All the people staying here seemed to go out of their way to introduce themselves to me and a few even invited me to dinner/drinks, which hasn't happened too often. Never a shortage of showers/toilets. Kind of noisy outside on a Saturday night, so earplugs were required, FYI. Great view though! 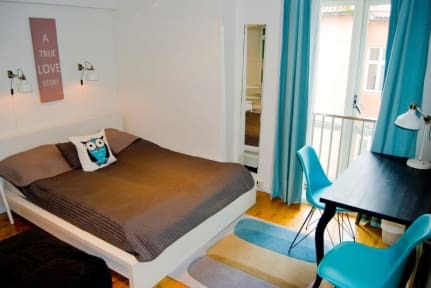 The location is perfect, 5 minute walk from the train station and light rail stops, a 10 minute walk to the restaurants and bryggen but far enough away that it’s quiet at night. However, the front desk is only open until 4pm, which also means the front door is open and until then anyone can come in, use the common area (only 2 couches worth), use the showers, and then dip out. We also barely had enough outlets per bed in the room and half the bedside lamps didn’t work. Bed and sheets were comfy.